This article details how to expose an OData feed of live Salesforce data in Microsoft Power Query. Follow the procedure below to start working with Salesforce data in Power Query. If you have not already connected successfully from the administration console, see the "Getting Started" chapter in the help documentation for a guide. Configure the API Server to use a version of the OData protocol that is recognized by Power Query: In the administration console, click Settings -> Server and change the value of the Default Version property to 3.0. From the ribbon in Excel, click Power Query -> From Other Data Sources -> From OData Feed and paste the OData URL, https://your-server/api.rsc. Define authentication credentials and set privacy levels: In the next step of the wizard, select Basic authentication and enter the credentials for an authorized user. To change the authentication settings, click Power Query -> Data Source Settings -> the OData feed -> Edit Credential. Select the privacy level from the menu on the Data Source Settings page. You can manage users and authtokens in the API Server administration console by clicking Settings -> Users. You can now access live Salesforce data in Power Query. 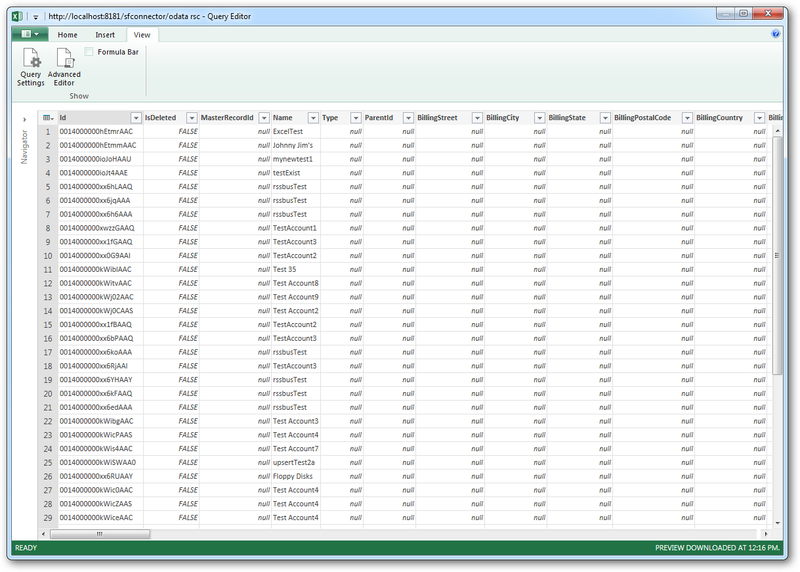 In the Navigator expand the node for the OData feed, right-click a table, and click Edit to open the Query Editor. This will display the table data.